Dengen Chronicles is the most engaging Online Customizable Card Game in the Manga universe. The innovative addition of strategy and role-playing aspects makes the gameplay original and intense. 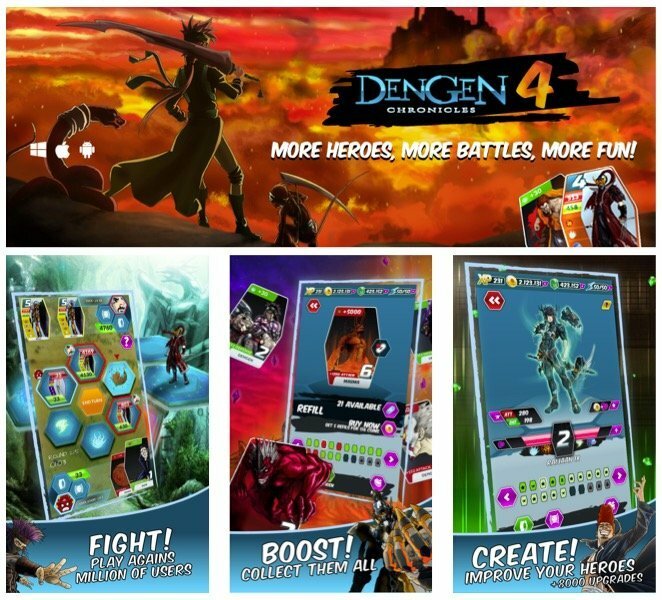 Dengen Chronicles is the first game ever that mixes TCG and RPG elements for Manga lovers. Four Manga families are in war: Ninja, Fantasy, Robot and School. Pick a side, create your deck of super customizable warriors and start spectacular fights. The heart of the worlds, Kokoro, pure Dengen energy crystal was created to ensure balance between the dimensions of fantasy. Draidrok the ancient, to take its power, accidentally destroyed Kokoro, scattering its energy. The worlds started to collapse, while the creatures of fantasy where unaware of what awaited them. When the ancients sent their emissaries to avoid the worst it was too late, the barriers between different realities had fallen, the battle had begun. The old Kokoro guardians had lost control and the four main bloodlines started the fight to take the Dengen energy.